No more excuses for being late, San Pedro. As of about 2 p.m. Wednesday, the giant clock that had kept everyone on time for decades began working again. Built in 1942 on what was the town’s new Municipal Ferry Building, the timepiece has been an iconic part of the waterfront, visible far and wide from its spot at the end of Sixth Street at Harbor Boulevard. Eventually, the old clock began to run out of juice. 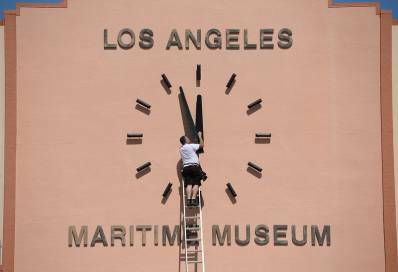 “Over a year ago, we noticed it was losing time,” said Marifrances Trivelli, director of the Los Angeles Maritime Museum now housed in the iconic terra-cotta building on San Pedro’s waterfront. By turning the power off and rebooting, museum staff was usually able to get it back up and running on time for a few weeks. But, eventually, that stopped working. A more permanent fix would have to be found. 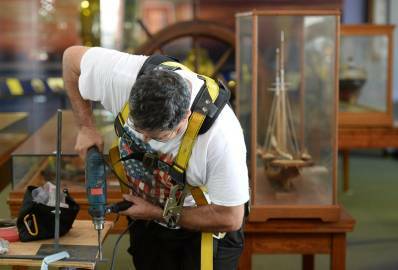 Enter “Tick Tock” Tony Baker, who specializes in fixing antique and tower clocks. A native of Great Britain, he and his wife, Linda, have devoted themselves to full-time clock restoration work from TickTockTony, their Trabuco Canyon business launched in 2010. Among his most recent projects was fixing the tower clock at Union Station in downtown Los Angeles and the tower at St. Andrew’s Catholic Church in Pasadena. “We were originally told that no one did this work anymore,” Trivelli said. Baker said he’s currently the only one on the West Coast who specializes in the classic tower clocks that can be found on churches, school campus buildings and even shopping malls. Baker, commissioned by the city earlier this year to do the job, went to work Monday using ladders, drills and electric lifts to get the timepiece running again. He arrived already armed with a custom-built motor he’d put together and figured the work would take about two days. While the insides of the clock are new, the minimalist outside design — featuring simple bronze hour markers and 6-foot-long wooden hands — are all original. A Jan. 8, 1942, article in the former San Pedro News-Pilot chronicled the clock’s installation nearly 75 years ago. “A big 12-foot clock today was being installed on the Sixth St. face of the new ferry terminal building,” the article stated, noting that the new ferry terminal building was expected to be put into operation by the end of the month. The clock now is illuminated with a spotlight although some blue LEDs to match the nearby bridge as a backdrop naturally come to mind in looking at the edifice now at night. All the old parts from the original clock motor will be kept by the museum as part of its history collection. A photograph from the early 1940s shows the old Los Angeles Red Cars — and a Main Channel stripped of the modern container ships, cranes and stacks of containers that make up the port landscape today — surrounding the building that still looks much the same. According to the Daily Breeze’s South Bay History blog, the ferry building was authorized as part of the New Deal’s Works Progress Administration program and was designed by Los Angeles Harbor Department architect Derwood Lydell Irvin in the sleek Streamline Moderne style. In 1996, the building was listed in the National Register of Historic Places. Once the new motor was designed and built, the toughest part of getting the clock running again, Baker said, was the physical and logistical challenge of reaching the tiny back-end enclosure housing the clock’s inner workings, located about 30 feet above the floor and just below the building’s open-beam ceilings. “Every one of my jobs is unique, every one has its own challenges,” Baker said Monday as he took a break from the project. 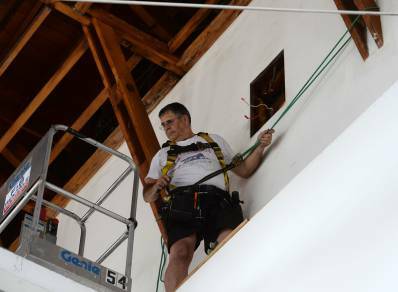 After working on the motor, he took a stroll across part of the roof Monday to examine the outside before returning the hands that had been removed earlier in preparation of the work. The new setup includes a bit of high-tech ingenuity: a piece that will automatically adjust the clock for daylight saving time and back again. In the past, the clock had to be shut down twice a year so it could manually be adjusted for those annual time changes. While most now rely on their smartphones to get the correct time, the giant clock on the waterfront seems never to outlive its intended purpose. “I was so surprised, we have gotten so many calls from people” about what had happened to the clock, Trivelli said.